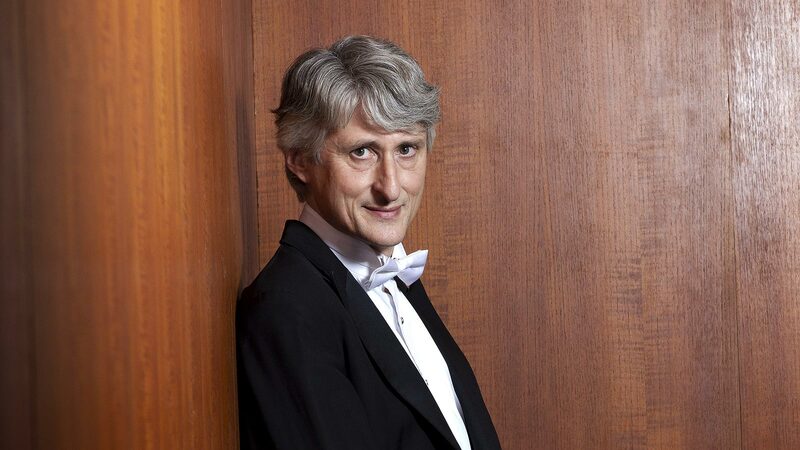 The conductor Prof. Anthony Bramall studied singing at the Guildhall School of Music and Drama in his native London, graduating with honors. There followed a two-year supplementary course in conducting with Maestro Vilem Tausky . In 1981 Bramall moved to Germany to become assistant to the Music-Director of the Municipal Theatre Pforzheim. In 1984 at the Third Hans Swarovsky International Conducting Competition in Vienna he was awarded the special prize for interpretation of music of the 20th Century. Bramall debuted in 1987 with the Vienna Chamber Orchestra at the Konzerthaus in Vienna -- and the recording industry took notice: he recorded three CDs for the Naxos label with the Slovak Philharmonic and the Slovak Radio Symphony Orchestra; radio recordings with the then RIAS Orchestra of Berlin followed. He was appointed to conducting positions in the municipal theatres Augsburg, Coburg and the State-Opera Hanover. A milestone in Bramall’s career was his collaboration with the Semperoper Dresden, home of the world famous Staatskapelle : in 1992 he conducted the new production of Rossini's "La Cenerentola". This success was followed by engagements for „La Bohème“ and „La clemenza di Tito“. In the summer of 2003 Bramall directed the premiere of Dresden’s new production of "Madama Butterfly". In 1995 Bramall was appointed General Music-Director of the Municipal Theaters Krefeld and Mönchengladbach . At the same time his burgeoning career as a guest-conductor -- in Augsburg , Berlin, Bonn , Darmstadt , Dresden, Düsseldorf , Hanover , Karlsruhe and Wiesbaden as well as in Bratislava , Bucharest and Poznan – established his excellent reputation in Germany and neighbouring countries. In December 2003 he made his debut in Japan with five concerts with the Tokyo Metropolitan Symphony Orchestra , and in the summer of 2006, he conducted three concerts with the NHK Orchestra, Tokyo. In 2002 Bramall became General Music-Director of the State-Theatre in Karlsruhe , where he began his first "Ring" in 2004 with the premiere of "Das Rheingold ". This was followed in October 2005 by "Die Walküre", "Siegfried" in September 2006 , and in December 2006 the Karlsruhe Ring cycle was completed with the premiere of "Götterdämmerung". In October 2007 Bramall enjoyed an overwhelming success with the premiere of Strauss's "Die Frau ohne Schatten". He made his debut at the Bavarian State-Opera in Munich in January 2004 with -- once again -- "La Cenerentola". In February 2005, he first visited the USA for concerts in Charlotte, NC., and in November, he debuted in Sweden with a new production of Verdi's "Falstaff " in Gothenburg. In April 2006 in Italy Bramall conducted seven performances of "Die Walküre" in Cagliari, Sardinia. Since then, he has returned five times to conduct symphony concerts at the Teatro Lirico. At the end of the season 2007/8 he left the Staatstheater Karlsruhe and spent three years in Weimar as Professor of conducting at the Hochschule für Musik Franz Liszt in Weimar. As a freelance conductor, he was in charge of new productions of "The Pirates of Penzance" and "The Love for Three Oranges" at the State-Theatre, Gärtnerplatz in Munich; in February 2010 he returned to the Teatro Lirico di Cagliari in Sardinia to conduct a concert performance of the opera "I Shardana" by Ennio Porrino. At the beginning of the season 2011/12 Bramall became permanent guest conductor at the Leipzig Opera , where he led a new production of "Tosca" to great acclaim. Since the season 2012/13 he has been Deputy General Music-Director , where he conducted a new production of "Nabucco" by Giuseppe Verdi, produced by Dietrich Hilsdorf . In September 2013 he returned to Cagliari for a new stage production of "I Shardana", produced by Davide Livermore. At the Leipzig Opera, he will conduct the premieres of Donizetti's "Don Pasquale" (February 2014) and Stravinsky's "The Rake's Progress" (April 2014), as well as the Ballet-premiere „Pax 2013“. Starting September 2017 Anthony Bramall will become Chief Conductor of the Staatstheater am Gärtnerplatz, Munich.